Immaculate Waterfront 4BR 4.5BA on Pensacola Beach W/ Private Dock Sleeps 14!! Kayak, Paddleboard Included! 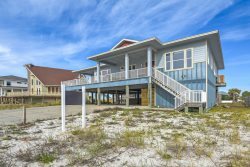 A comfortable, cozy and completely renovated home, located directly on Pensacola's beautiful sound and a short 5 minute walk to the sugary white sands of the Gulf. This home has 4 bedrooms, 4.5 baths, and features gorgeous views of the sound from the living room, dining room, master bedroom and expansive new deck. The best part about this property is the fact that it's located directly on the sound. A few steps out your back door and you're in the water. Swimming, paddle boarding, snorkeling, fishing, skiing...the sound provides calmer, shallower waters to accommodate young children and water sports that the gulf doesn't usually allow. The brand new 50' private dock with a boat slip allows you to bring your own boat and to fully enjoy the local life and all it has to offer. The owner, as a bonus, includes with the property a paddleboard, kayak, beach chairs, and beach cart. This property sleeps 12-14. Each bedroom has it's own bathroom and TV. The master bedroom is equipped with a king size bed and a full size daybed/sleeper sofa, a 60" flat screen TV and has a private bath with oversized tub. This master has stunning views of the sound. The second bedroom is a second master suite with king bed and attached full bathroom.The third bedroom has a queen bed and an adjacent full bathroom. In addition, the fourth bedroom is a built-in bunk room with 4 narrow twin beds and it's own bathroom - perfect for kids and teens and on main living floor. All of these bedrooms are beautifully decorated and the bathrooms are modern with attractive tile work. The sleeping accommodations are sure to please! The main living space is open, bright and airy with amazing views of the sound. It has a sleeper sofa and loveseat and large flat screen tv. With a fully stocked kitchen and large farmhouse table, you'll be prepared for any meal. The living and dining room open adjacent to the galley kitchen and work well for entertaining. The new waterfront deck includes a dining table with chairs and is perfect for unwinding and taking in the sunset. This is the perfect waterfront setup! The feature you will enjoy the most is the oversized attached deck looking directly over the water with easy walk down access to your own private 50 ft dock and boat slip. Catch trout and redfish right in your own backyard or bring your boat for some offshore fun. This is a fisherman’s dream. There is a trolley stop at the entrance to Santa Rosa Villas for easy transportation around the beach. This home is ideal for a couple of families traveling with children or multiple generations of the same family. Don’t miss out on the opportunity to vacation in this charming property. Book now for 2018!